Hugh Stobbs never got paid a dime. Sure there were a few complimentary Big Boy triple-deckers and a free lobster dinner once, but nothing compared to what he deserved for serving as the race director of the Elby’s Distance Race for 25 years. The first year was 1977, a time when the Wheeling Civic Center and the Wesbanco Bank headquarters were preparing to open in downtown Wheeling and also during an era when road racing was the rage in the United States but had not yet arrived in the Wheeling area. And then it did thanks to the Elby’s Distance Race, an event that offered a 12.4-mile course that roamed over three “gut-break” hills and guided runners from throughout the world through 10 different Friendly City neighborhoods. This May the 40th race will again be staged in the downtown district, and it is now known as the Ogden 20K because in 2002 the local publishing company adopted the event once Elias Big Boy dropped out because of financial strain. In its prime, though, the Elby’s Distance Race welcomed runners from all 50 states and from 69 different countries, averaged close to 1,600 competitors, and won international acclaim because five men concocted a crazy idea one evening. “There were a few people from here in the Valley who were interested in starting a race here in Wheeling because if you wanted to run a race, you had to go to Akron or Butler or other places that were a good distance away from here,” Stobbs recalled. “And there weren’t a lot of us in this area who were runners at the time. But they needed money. 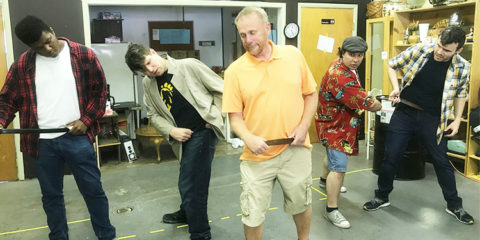 Not a lot of money, mind you, but the group estimated that at least $10,000 in start-up cash was necessary to pull off what many naysayers doubted could be accomplished. 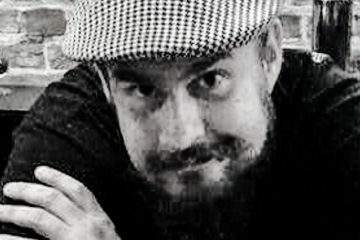 “I did know that the first thing we needed to do was to get a sponsor so we could raise the funds we needed to get the whole thing up and running, and that’s when Lee Jones said that he would talk to his father, who, at the time, was the owner of First National Bank in Elm Grove,” Stobbs reported. “He called me back the next day and he told me that the bank would cover half of what we thought we needed, and he also suggested that we speak with the Boury brothers because they were a big depositor at the bank. “So that’s what I did. I gave the Bourys a call and got an appointment for the next week, and then I met with the three brothers,” he continued. 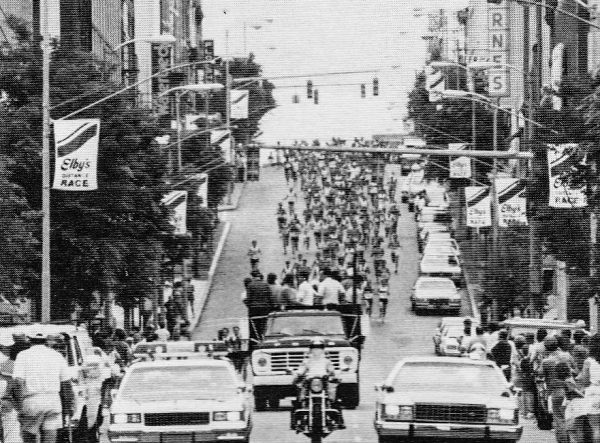 “Now remember that this was in 1976, when running wasn’t a big thing around here, so I really didn’t know what to expect from them after I presented our idea about a road race here in Wheeling. 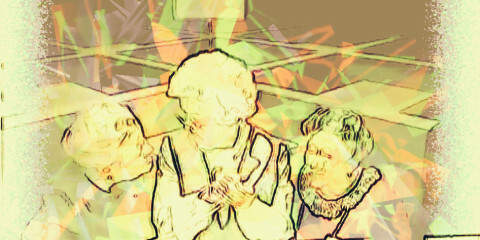 Though the initial meeting went well, Stobbs and his committee members decided to test George, Ellis, and Mike Boury by racking up a hefty bill at a very popular, upper-scale restaurant that was not an Elby’s Family Restaurant. “We wanted to make sure that they really wanted to do it, so the five committee members at the time went up to the Anchor Room in Beech Bottom and had a real nice dinner and a few drinks,” Stobbs said. “And then we gave the receipt to the Boury brothers, and they gave me a check right away. 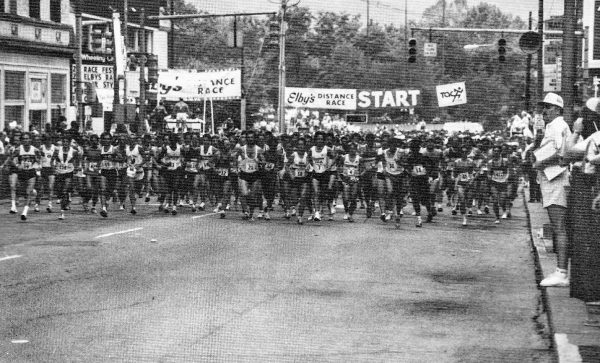 Instead of offering prize money to winners in the beginning, the race committee opted to recruit nationally known runners and offer them appearance fees, free meals, and complimentary lodging during their time in Wheeling. Many of the runners would stay at the McLure Hotel in downtown, and several were adopted by volunteer host families. The appearance fee the first few years was $500, and four big names agreed to travel to the Northern Panhandle for the inaugural event in May 1977. “When George told me he wanted the race to be first class, I became determined to invite the best runners I could contact, and Frank Shorter was the big news in running at that time. I called him in Colorado Springs, and he answered the phone. I said, ‘”Well, Mr. Shorter, this is Hugh Stobbs from Wheeling. You probably have never heard of Wheeling, but we are holding a 20K race very soon, and we would like for you to be here for it. “He immediately asked me, ‘Does Wheeling have a big hill with an Indian statue at the top with his arm out?’ I said, ‘That’s us.’ And he said, ‘We broke down there when I was a kid, and the people in Wheeling were so nice to us.’ He said the mechanics were great and that a couple of families even offered to put them up for the couple of days while their vehicle was getting fixed. And it was Bill Rodgers who snapped the very first finish-line ribbon. 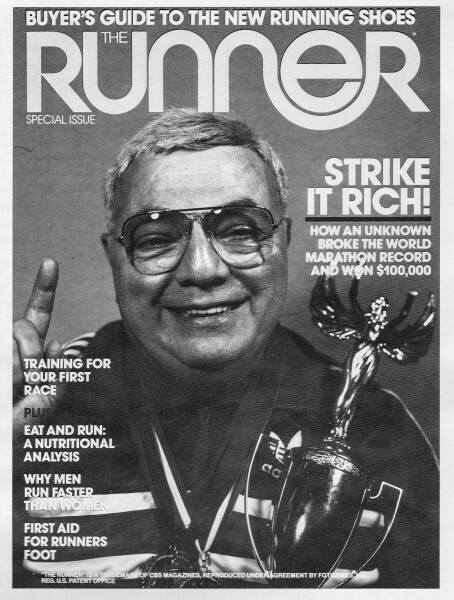 Rodgers was ranked by Track & Field News as the world’s top marathoner in 1975, 1977, and in 1979, and he won the Elby’s Distance Race three times. In all, Rodgers was victorious in 22 marathons across the world. “He was one of the best; that’s for sure, and the course fit his style more than it did Frank’s and the other known runners,” Stobbs said. “And ever since Bill and I have become great friends, and he helps me now with the Veterans Race that we started a few years ago. 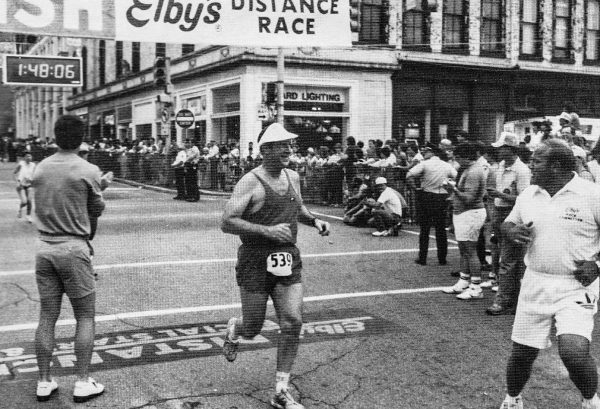 The course for the Elby’s Distance Race actually traveled outside the city of Wheeling for a brief stretch because Stobbs designed the path to include the 29th Street Hill that curved its way to the village of Bethlehem. Once runners reached the peak, they almost immediately began their descent into the Elm Grove section of Wheeling. After passing Bridge Street Junior High (now Middle) School, the runners veered left onto U.S. Route 40/National Road and followed the roadway past the Edgwood, Woodsdale, and Fulton sections of the Friendly City while huffing and puffing up and down “Chicken Neck” and Wheeling hills. The course then returned to the downtown, where the starting line doubled as the finish line in front of the Wheeling Civic Center, now known as Wesbanco Arena. “I told them that I would lay out a course that I thought would work, and one of my goals when doing that was to make sure that the participants got a feeling of satisfaction when they finished,” Stobbs explained. “At that point those guys said that if I was going to lay out the course, I might as well be the race director, and I had no idea what that really meant. I just went with it. 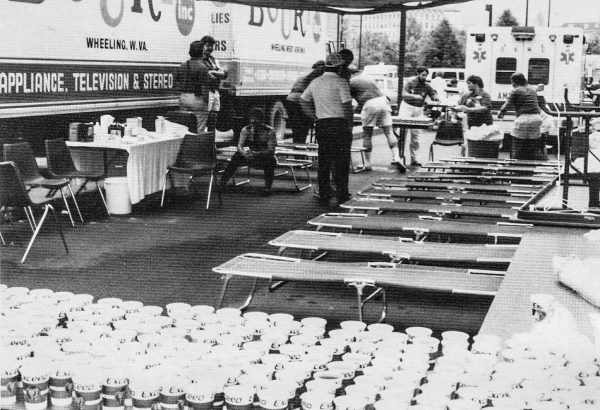 And the streets were lined with aid and water stations manned by volunteers, and the course was often packed full of fans who wished to witness what became known as an elite event. “People really reacted to the race in an impressive way, and I will always owe a debt of gratitude to Bill Van Horne because he always did an excellent job with all of the articles that he wrote about the race and those who were participating,” Stobbs said. “It sure did help when I was able to get runners like Bill Rodgers and Frank Shorter here in Wheeling. The people may not have known much about road racing, but they knew those kinds of names. Following the first race, Stobbs found himself inundated by requests from local residents. Another change was orchestrated following the inaugural distance race and that was the departure of First National Bank as a co-sponsor. “The Bourys wanted to take it all over; the entire sponsorship and everything. They were pretty impressed,” Stobbs reported. “It was really too big for the people at First National Bank. They wanted the local advertisement for them, but Elby’s were popping up everywhere. 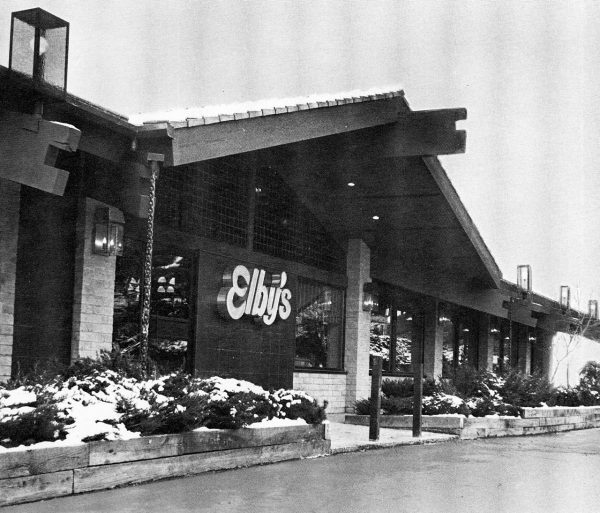 That’s when Elby’s was in the middle of their expansion period. As the reputation of the Elby’s Distance Race grew, the event started attracting international competitors, including Michael Musyoki, a Kenyan runner who would win Wheeling three times. 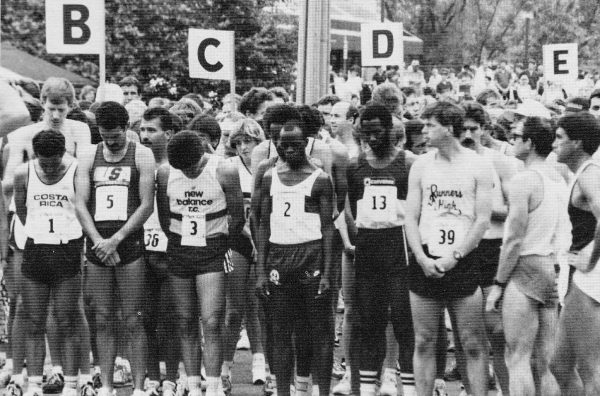 In the mid-1980s the distance race was tabbed the U.S. men’s 20K championship, and then it became a trial event for the U.S. Olympic team. The top runners finished the course in 70-75 minutes while local competitors were pleased to pass the finish line in a couple of hours. “The USA Track and Field got in touch with me, and they wanted to make the race the country’s 20K championship, and of course that was fine with me. So they sent people to Wheeling to certify the course,” Stobbs said. “After the second year as the U.S.A. championship, they then decided to make the Elby’s an Olympic qualifier. We didn’t even apply for it. They just did it on their own because of all of the prestige the race gained very quickly. “The Elby’s became so well-known because of word of mouth. That’s how it became so big. I know when I would run races in Europe, people over there even knew about the Elby’s race,” Stobbs said. “Plus, the foreign runners would all talk about it, and that’s how I had runners from 69 different countries come to Wheeling. The smell of the country-friend chicken. That is the first memory that comes to Gregg Boury’s mind when asked about his memories of the Elby’s Distrance Race. In 1977 Boury was employed at the Boury Warehouse, but in later years he was working in the food field, and on race day 11 different Elby’s Family Restaurants and the commissary kitchen were charged with producing a total of 7,000 pieces of fried chicken for the awards banquet that followed the annual event. “Oddly enough, when I think of the distance race, I think of the chicken that was served at the banquet,” Boury said. “I’ll never forget having all of that chicken that was made at the Moundsville Elby’s in my car and that smell. It was 10 cases of chicken, and I’m willing to bet that was more than a thousand pieces of chicken. The legs, thighs, and breasts were jettisoned to the Wheeling Civic Center from as far south as New Martinsville and as far north as Weirton, and the meal also included green beans, cole slaw, potato salad, and dinner rolls. Employees of Elby’s served the buffet line in 30 minutes as mandated by the brothers, and once all in attendance were able to sit down and enjoy the meal, Stobbs would begin distributing the many awards. “That banquet was a lot of work; that I can tell you for sure,” said Jim Edge, a longtime Elby’s employee. “Somehow we managed to pull it off every year for all of those people. And that was a lot of chicken. Donna Holmberg began as a curbside and inside waitress in Center Wheeling the year before the first race, but she eventually scaled the company ladder to Service Director for all Elby’s restaurants. She recalled that once the starter’s gun was fired, two races actually began. One, of course, was the roadway run, and the other was prepping for the banquet. “We had something like 30 minutes to get everyone their chicken dinners,” Holmberg said. 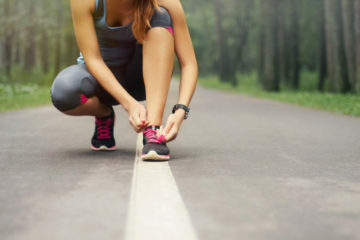 “While the runners were doing the race, we were very busy getting all of the chicken into the civic center and then getting all of the food lines ready for everyone to come in and start eating before all of the announcements and the awards. In the all years since Stobbs served as the distance race’s director, he has heard about the many memories from those who volunteered and competed. “And over and over again I always hear how much everyone always enjoyed that banquet,” he said. “There was a lot of hard work that went into it, and I doubt most people understand that. I know I was always surprised when I would finally walk into the building. They were always lined up and ready to serve those chicken dinners. Stobbs, though, had his doubts in the beginning. “When we were planning it all out, I just didn’t know how it was going to be coordinated all at the same time. 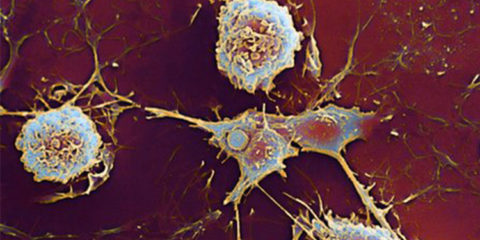 It just seemed very complex to me because of how many restaurants and how many employees were involved,” he remembered. “All of those people and all of that chicken? It really did seem kind of impossible to me at the time. 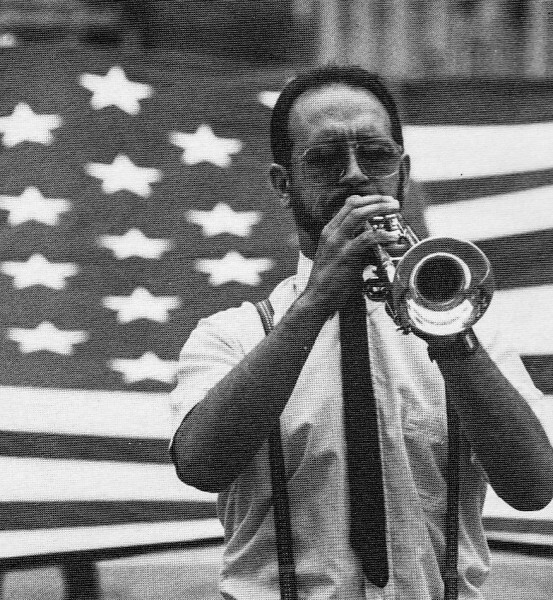 Bill Bryson, the marketing director for Boury Enterprises for more than two decades, was in charge much a lot of the orchestration that took place on race day. “It was after the race got started when a lot of us started to feel the real pressure that day,” Bryson revealed. 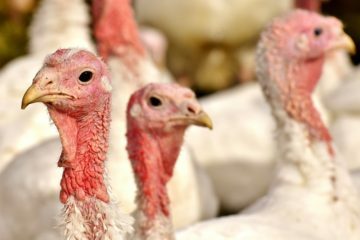 “That’s because the banquet had to go the way it needed to so a couple of thousand people would get their meals. The primary goals of the Elby’s Distance Race were easily understood by Stobbs and all those involved. 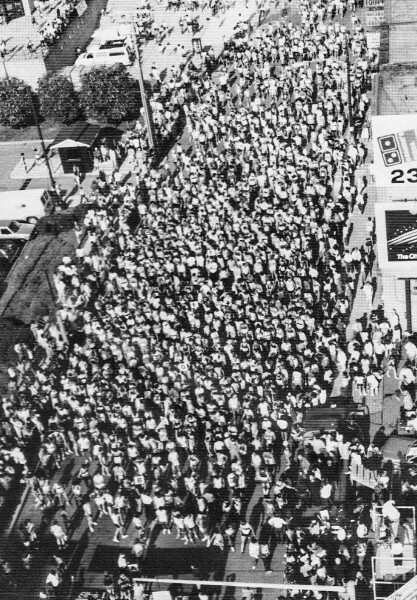 They wanted to give the runners a positive experience; they wished to promote the city of Wheeling; and they hoped the Elby’s Family Restaurants in communities throughout the tri-state area would become even more popular than the eateries were already. “The race was huge for the restaurants, for the company, and for the entire Ohio Valley, really,” Boury said. “It was great marketing for the company; there’s no question about that. It was a great idea, and Hugh Stobbs did the best job anyone could have expected. That race quickly became a race that was in the national spotlight, and I give Hugh and his committee all the credit for that. The Elby’s Distance Race transitioned into the Big Boy Classic in 1989 after the Boury brothers sold the franchise to Elias Bros. Co.
“I was told by the Boury brothers that Big Boy would operate the race the same way we had for all of those years, and that’s all I really cared about. 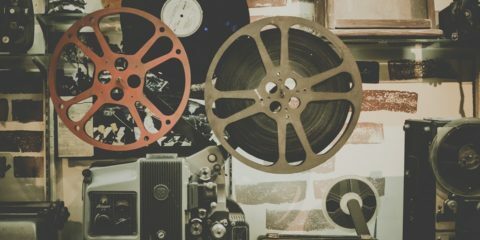 I admit that I was relieved that first year because I just went about it the way I had, and they were always OK with it, and those folks seemed to really enjoy it when they would come in for it,” Stobbs explained. “The brothers were great to me all of those years. We couldn’t have had a better sponsor because all they were concerned with was putting on a high-quality event. 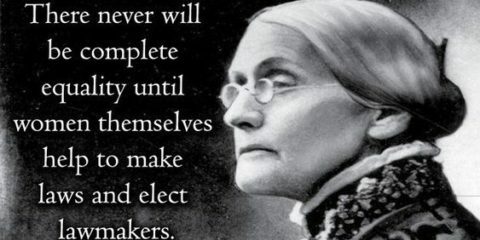 I always kept things within reason because I acted as if the money they gave us was my own money, but no matter what we wanted they always came through. But the Big Boy Classic took place just three years because the company fell into financial constraint. So, after a quarter-century working with the Bourys and Elias Bros. Co., the event was renamed the Ogden Classic and remained the same for the next two years. That’s when, Stobbs recalled, he received a letter from the publishing company while vacationing at a family owned condominium. “Right after the first race they told me that they wanted to start cutting back on some things, and I told them they couldn’t do that. I told them that they had to keep improving it, not changing it,” Stobbs said. “They went along with it for one more year, but then I received a letter in the mail while I was in Florida, and the letter said that they were going to cut out the banquet and some other things that I thought were very important to the quality of the event. There is still some semblance of a race in Wheeling every Memorial Day weekend, but the glory days came to an abrupt ending when Stobbs stepped away. First off I want to thank the writer for this wonderful and important story. What can I about Hugh Stobbs and this race but that it has made me the runner I am today. There isn’t a more perfect course than this in all the world. Challenging. Scenic. My dad’s side of the family was from Wheeling and I’d visit a lot as a child. In fact the house in which he was raised was built in the late 1800s and still stands today on Jacob Street, along the course. When I started running in the late 1980s this was the first tough run I had ever done. I have done “The Elby’s” (as it will always be called to me..) every year since 1991 except once. This year will be my 25th. 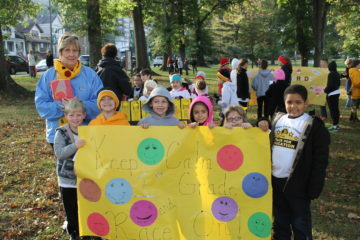 Mr. Stobbs has put in so much effort into this race over the year. It was a regular stop for the world’s elite runners. And I first met my hero Bill Rodgers here in Wheeling at the race. Another super nice human being and ambassador. While I would be sad if the race ever went away and I appreciate those who run it today but the race may never never return to its glory days. I will run this race until I die and part of my ashes will be disbursed along 29th Street hill someday. Haha. No, I’m not kidding. Thanks to all in the past, present and future who have made this race great. The quintessential road race. It may be a similar course still, but far, far from the same affair. Thanks, Hugh, and all who were involved. It was truly a world class event! 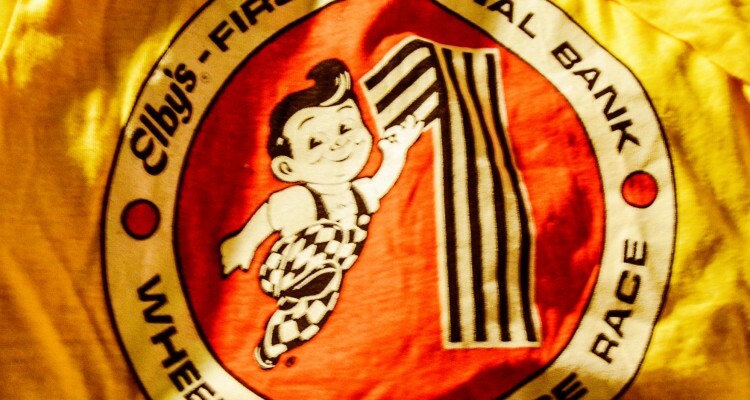 Whenever I saw the Big Boy holding that huge strip of bacon in the race logo I always had an insatiable desire to hit the Elby’s breakfast bar. Steve, back when it first started I was working for W.P. Dickerson the General Contractor for the I-470 by-pass that went over the 29th area and recall seeing the runners trailing everyday up 29th. Great Story, Great Memories and YES, the Boury Brothers should have been in the Wheeling Hall of Fame years ago when they were living. A terrific article and all the story is here.Ill never forget running the Elbys wheeling Road race and so many of the good people I met in wheeling.Hugh Stobbbs is at the head of the list. The Elbys Wheeling Road Race was one of the most challenging courses I have run,and I,ve raced around the world.I have awin at asignifican Marthon on 5 continents,so you know I knw the sport.Hugh and his Team,and the Boury brothers,and the people of wheeling created an American Classic Road Race..
Bill – on behalf of every runner who ever competed in this race a big THANK YOU. You have been and always will be an inspiration to me. We would watch the start of the race, then rush over to Main St to watch the flood of runners coming down there, then run to the restaurant for breakfast and finish in time to see the finishers. It was a first-class race when Hugh Stobbs ran it. Wonderful article and it was an honor to run Elby’s back when Hugh Stobbs did the race. He is one of the best race directors in the world and fortunately Hugh has created another awesome race that honors our Veterans. Come to the Lois Stobbs Memorial 10km this Nov 5th and experience an awesome race with great hills, water stops, traffic control, beautiful finishers medals and age group awards. It is a great experience.